Preventative care is crucial to your overall dental health. Regular bi-annual dental appointments are essential for checking for issues like decay, loose fillings, weakening crowns or loose veneers. The exam is your first line of defense when it comes to preventing small problems from getting bigger. 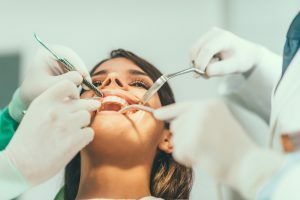 What is involved with a Dental Exam? A dental exam involves a thorough examination of the gums and mouth, and the teeth. During the exam, your teeth will be checked for signs of decay or cavities, as well as loose fillings, crowns and bridge work. The dentist will also check your bite and jaw for any underlying issues. Your teeth will be professionally cleaned, and any stains or deposits will be removed from your teeth. If you have implants, they will be checked to ensure they have healed properly and aren’t infected or inflamed. The exam also checks for oral cancer, which may go undetected if you miss your dental appointments. Having a dental exam might also include X-rays (radiographs) or other diagnostic procedures. Why are Dental Exams so important? Exams help to detect underlying problems that can be resolved while they still are treatable. Exams are essential for finding issues that could otherwise go unnoticed. Exams are essential for oral cancer screening. Your dental exam is the perfect time to ask questions that you have concerning your dental health. Exams help to evaluate your overall dental health and hygiene. Exams help to evaluate your need for tooth restoration or tooth replacement. Exams help to check your bite and jaw for any problems. Exams help evaluate risk of tooth decay, root decay, and gum or bone disease. Exams can help remove built up plaque and tartar therefore preventing periodontal disease. If you need a dental exam, contact our office today and one of our helpful staff members would be happy to assist you!